I tried my hand at some dyeing yesterday. I wanted to create something cheerful. I'm a bit color-impaired so I looked for some inspiration and guidance. Here is the Pantone 2006 Spring color forecast. I was worried about colors blending to make muddy brown. So I picked French Vanilla, Lily Green, Skyway and Viola assuming that if each color could blend with it's neighbor and still make a desirable color. 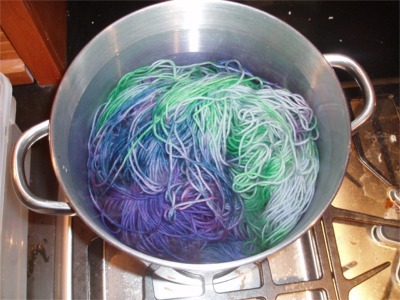 I soaked my wool for a good long time. I then tried to get most of the excess water out. First I put it in the salad spinner. It was still too wet and my arm got tired. So I put it in a lingerie bag and spun it out in the washing machine. Unfortunately by the time I was ready to "paint" it had gotten a bit too dry. 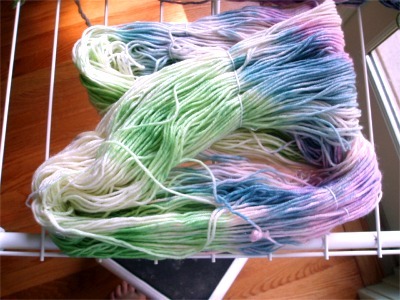 My dyes were also a little haphazardly mixed as far as how much water I mixed with the dyes. 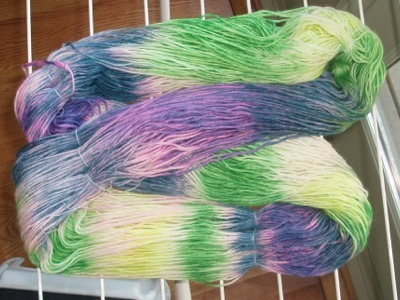 The yarn drank up the dye and the dye did not wick at all so I ended up with colors that were more intense than I intended and white spaces between colors because there was no spreading. I decided to overdye the whole skein with a very faint light blue so eliminate the white spaces and tone down the screaming yellow (what happened to French Vanilla?). As Groundskeeper Willie would say, "Back in the Loch with you, Nessie!" I think it helped a little. The crazy yellow is really toned down. But still it was kind of blah. So I tried again. 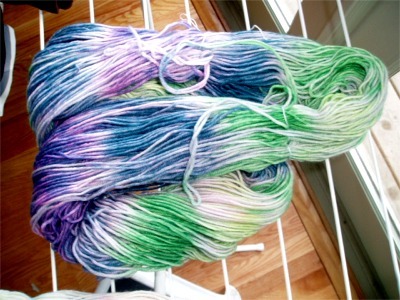 This time my skein was nice and damp but not drippy. My dyes were weaker. The results here are way too pastel. It just looks watery to me. 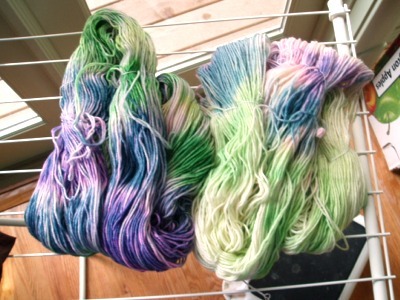 The light keeps shifting so here are the two skeins side by side. Now I don't know what to do. Should I keep tweaking these skeins by adding more colors? Should I completely overdye a dark shade? Should I start again?